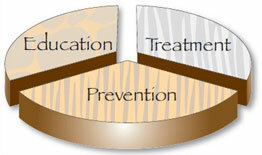 The Dental Safari Company believes in a 3-part approach to dental wellness. Although primarily focusing on mobile treatment for children at schools, this 3-part approach applies generally to a healthy dental lifestyle. "The combination of sealants and fluoride has the potential to nearly eliminate tooth decay in school-age children." The Dental Safari Company will come to your school and provide examinations, cleanings, fluoride and sealants for ALL children in ANY grade. The old adage holds true, "an ounce of prevention is worth a pound of cure." Also, our examinations meet state requirements for dental exams for children in Kindergarten, Second, and sixth grade. "Tooth decay is the most common chronic disease of childhood." Preventing dental disease is dependent upon good daily habits. Our professionals will visit classrooms and educate students on healthy dental lifestyles that will benefit them throughout the year until our next visit. "Tooth decay, left untreated will cause pain and tooth loss." Too many children have dental disease that causes pain and goes untreated. Any child that we classify as having urgent dental needs (e.g., abscess, pain) will be eligible to be seen in our Mobile Dental Unit. After our examination, we provide information of local Dentists that are accepting new patients. However, The Dental Safari Company does not just provide an examination and move on. If a child does have urgent dental needs, they can be scheduled for follow-up dental care by us. Excellent job! Excellent service! We have been very happy with the level of professionalism displayed by the staff and the care given to all our students. I've used other mobile dentists in the past and you have been the easiest to work with.